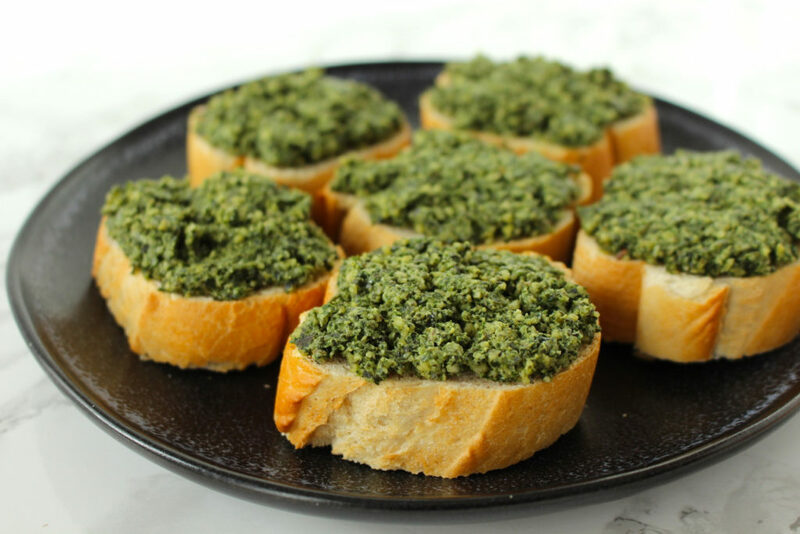 This pumpkin seed pesto recipe is inspired by the one I had at one of my favorite Italian restaurants in Munich recently. 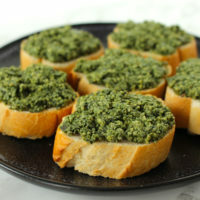 We had bruschetta with pumpkin seed pesto and yellow boletuses as a starter and were thrilled by the taste. Of course, I had to recreate something like that at home sooner or later. The homemade bruschetta turned out delicious and everyone at the last family gathering loved it. In case you prefer original bruschetta with tomatoes, you can find an easy recipe here, among other finger food ideas. There are also more recipes for spreads on the blog already, like this vegan herb butter and avocado herb spread. This pumpkin seeds pesto tastes great with crispy baguette or ciabatta. However, if you use a little bit of cooking water to water it down, you'll end up with a delicious pasta sauce. Roughly grind pumpkin seeds in a food processor. 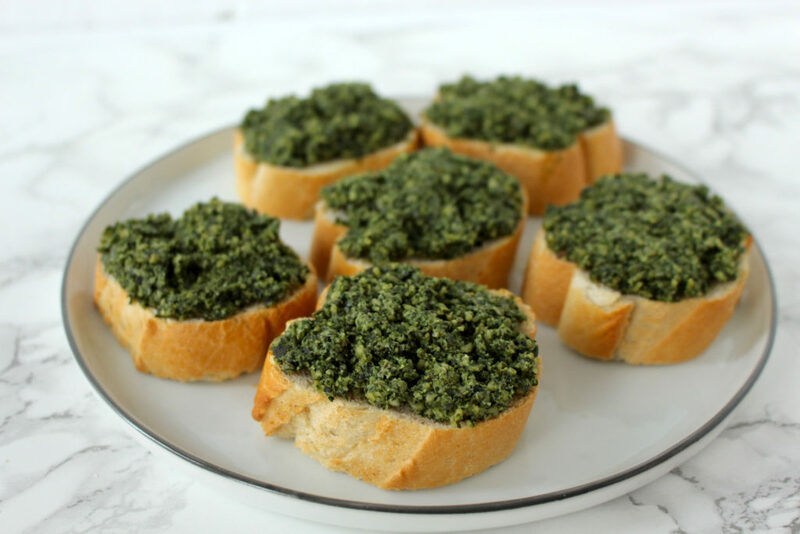 Add all the other ingredients and process until the pesto has a spreadable consistency (if necessary, add a bit of water to thin it down). Cut baguette into thin slices and place on a baking sheet. Rub top of the bread with some olive oil and bake for about 5 minutes at 350° F (200° C). Remove from the oven and top each slice with a tbsp of pesto and serve. I hope you love this recipe – please let me know in the comment section below! If you make this bruschetta, make sure to take a photo and share it on my Facebook page or on Instagram, using the hashtag #minamadefood. Oh and don’t forget to tag me (@thisisminamade) so that I can see your creations! Taste the World: Mexican Pepitas (Roasted Pumpkin Seeds) Secretly Healthy Vegan Avocado Basil Pesto Creamy Pumpkin Soup – Quick, Easy and So Delicious!